Rebecca, Tim’s wife and a fellow Heritage Young President’s Club member, did not share the same conservative upbringing as her husband. “Funny back-story, I was raised liberal,” Rebecca says. She admits she voted for Al Gore in 2000. 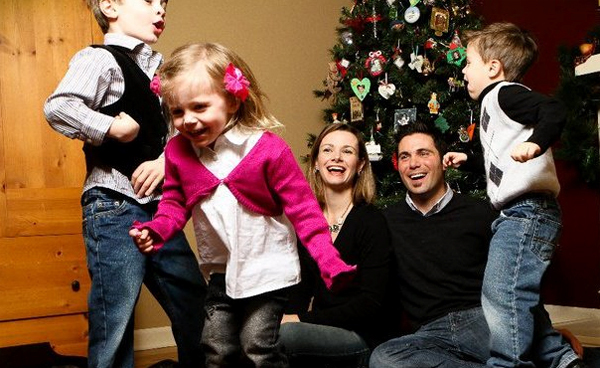 Today, Tim and Rebecca – and their adorable brood of three children – devote their many talents to advance the pro-life cause and to promote the conservative mission worldwide. Tim and Rebecca Kachuriak with their three children. For example, Tim, whose mother started the first crisis pregnancy center in his hometown, and whose father is an entrepreneur, successfully combined the lessons learned from his parents to start an innovative new internet program dedicated to saving unborn babies from abortion. The program Online for Life, now a year old, has verifiably saved 90 babies so far. Tim also works to advance the broader conservative movement. For example, he collaborated on the website What the Heck Have Conservatives Done?, a tongue and cheek online quiz that cites Heritage research extensively. And in his day job, Tim advises The Heritage Foundation and other organizations about their online strategies. Rebecca maintains a very busy schedule. On top of caring for three young children and remaining active with Online for Life, she involves herself in a women’s Bible study and various community groups. In addition, she runs the blog pottytrainingandpolitics.com, where she shares her experiences as a young, conservative mom-on-the-go. Rebecca’s thoughtful work has caught the attention of fellow bloggers, awarding her a frequent spot on the popular Conservative 21 website. You may be asking how Tim and Rebecca do it all. They would tell you that it’s through a strong faith, hard work and sacrifice. Their professional and personal successes perfectly illustrate their shared belief that “government’s role is not to provide for the people. Rather, government should exist to protect people so that they can freely pursue opportunity.” This is the American way. The Kachuriaks, true conservative crusaders that they are, have a passion for sharing their patriotic convictions with others – especially young Americans. Tim and Rebecca Kachuriak are leading the way in doing exactly that. And The Heritage Foundation is very proud to have them both on our team as YPC members. That’s exactly where the picture was taken…a few years back…pregnant belly and all! 🙂 Go Steelers!